American White Pelican (Pelecanus erythrorhynchos), #04-22, December 5, 2004, Provincetown (Barnstable), S. Landry† et al. (First ballot. Vote: 9-0). #04-21, December 7, 2004, Woburn (Middlesex), M. Rines* (First ballot. Vote: 9-0). #05-17, June 29, 2005, Plum Island, J. Nelson*, D. Noble (First ballot. Vote: 9-0). A report of five birds in Provincetown was unquestionably substantiated by a photograph of three of the birds flying by Provincetown’s signature building, the Pilgrim Monument. The individual seen in Woburn two days later may well have been part of this group, as may have been other undocumented sightings that were reported in and around Massachusetts at this time. Observers at Plum Island specifically watched a single bird standing and preening, and generally giving excellent views of all field marks. 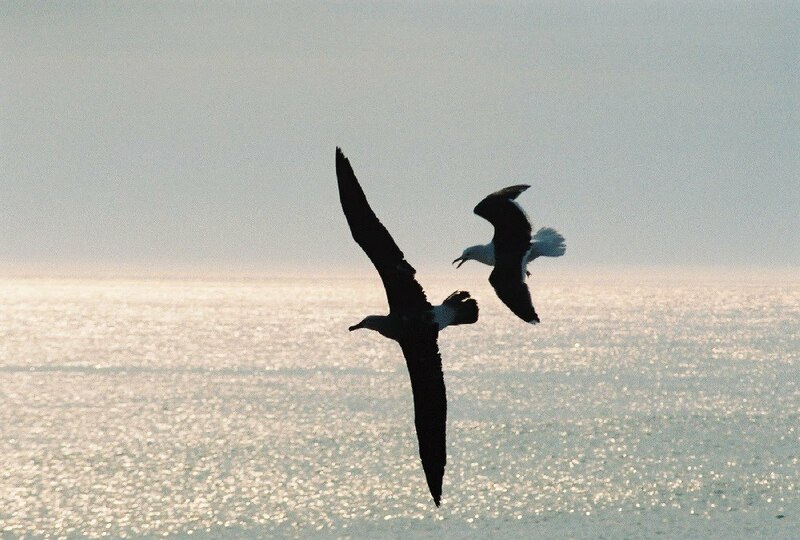 Magnificent Frigatebird (Fregata magnificens), #05-21, July 22, 2005, South Beach Chatham (Barnstable), G. Hirth, R. Merrill*†. The observers discovering this female frigatebird were lucky enough not only to find it, but to photograph it through binoculars. 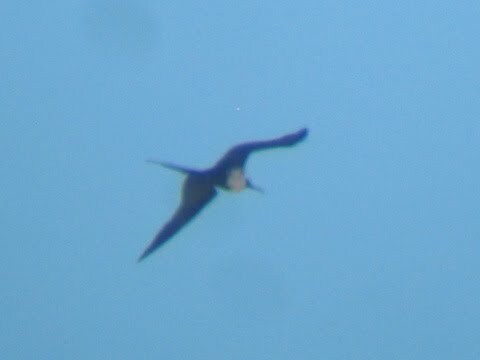 They were aware of other frigatebird species previously recorded in in North America, and carefully noted the black head and throat and white breast patch, marks that effectively eliminated Lesser Frigatebird (F. ariel) and Great Frigatebird (F. minor) as alternative possibilities. (First ballot. Vote: 8-1). White-faced Ibis (Plegadis chihi), #05-12, April 25-28, 2005, Plum Island, D. Noble et al., J. Berry*, T. Wetmore*, P. Brown† (First ballot. Vote: 9-0). #05-13, May 5-28, 2005, Newbury and vicinity, F. Vale*, P. Brown†, (First ballot. Vote: 9-0). This western vagrant is extremely rare in Massachusetts, with only four or five previous records (all but one in Essex County). It was therefore big news when the Plum Island bird was discovered in April. Only a week later, birders closely examining a flock of Glossy Ibises in Newbury picked out a White-faced Ibis and assumed that it was the same individual, until photographs revealed that two individuals were involved. The probability of two White-faced Ibises occurring so close to one another, both geographically and temporally, yet not associated, practically defied belief. Fortunately, photography of rare birds has become so commonplace that, combined with the advent of digital imagery and “digiscoping” (digital photography through a telescope), confirmation of such an unlikely coincidence was able to be established beyond a doubt. Wilson’s Plover (Charadrius wilsonia), #04-23, June 14, 2004, Ipswich Crane Beach (Essex), S. Maddock† (First ballot. Vote: 9-0). #05-10, June 8, 2005, South Monomoy (Barnstable), R. Merrill* (First ballot. Vote: 9-0). #05-14, June 11, 2005, Nantucket (Nantucket), E. Ray† (First ballot. Vote: 9-0). #05-18, July 5, 2005, South Monomoy (Barnstable), R. Merrill*† (First ballot. Vote: 9-0). #05-18B, July 11-22, 2005, Chatham South Beach (Barnstable), J. Trimble† (First ballot. Vote: 9-0). Wilson’s Plover was at one time nearly annual in Massachusetts, but sightings have declined over the past ten years, with only five reports since 1994. The 1994 Crane Beach bird was discovered just over a year after one was reported from the same location on June 4, 2003 (although details were not submitted to the MARC). In 2005 there was a rash of sightings probably involving four individuals between Chatham and Nantucket. The first bird was a female at South Monomoy on June 8. The second was a male on June 11 at Nantucket. On July 5 another plover was discovered on South Monomoy, this time a male, then, from July 11-22 a male was seen regularly at South Beach in Chatham. 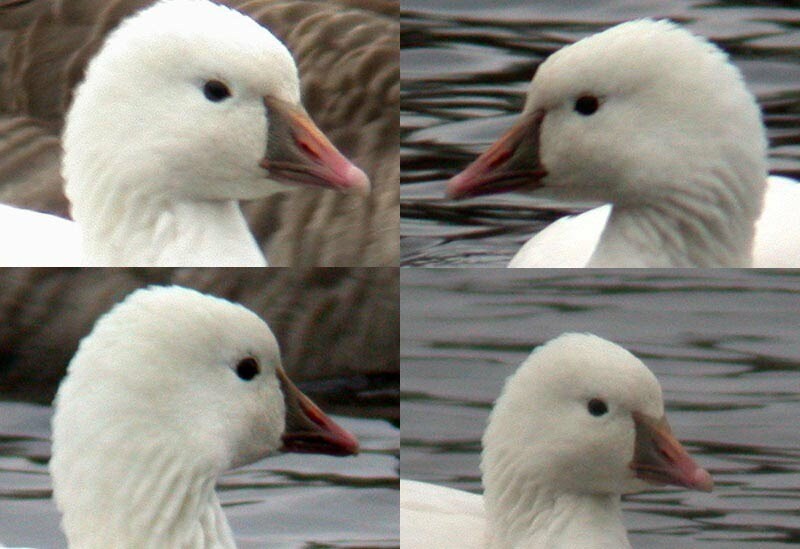 All birds except the female were photographed, and minor plumage variations in these photos suggested that different individuals were involved. Little Stint (Calidris minuta), #05-23, July 20-25, 2005, Chatham South Beach (Barnstable), R. Clem, N. Bonomo*†, J. Trimble† (First ballot. Vote: 9-0). #05-24, July 24-25, 2005, Chatham South Beach (Barnstable), J. Trimble†, B. Nikula*†(First ballot. Vote: 9-0). Several experienced birders observed a Little Stint on South Beach in Chatham, July 23-24. Personal observation and photographs taken on both days suggested that two different individuals might have been present, however variations in light and angle in the photographs left room for question over how many birds were actually involved. Photos by J. Trimble from July 23 and 24, respectively, suggest the possibility there were two stints involved. Franklin’s Gull (Larus pipixcan), #05-28, August 6, 2005, Chatham South Beach (Barnstable)V. Laux*, P. Trimble† (First ballot. Vote: 9-0). #05-29, August 20, 2005, Westport (Bristol), M. Lynch* (First ballot. Vote: 9-0). The Chatham bird was seen only briefly, but it was well described definitively photographed with a “point and shoot” camera. In Westport, observers were able to obtain excellent views, both at rest and in flight, with nearby Laughing Gulls for comparison. California Gull (Larus californicus), #05-01, January 3-18, 2005, Nantucket (Nantucket), F. Gallo*, P. Dugan, many photographers†. (First ballot. Vote: 9-0). #05-07, April 29-May 5, 2005, Lynn/Nahant (Essex), J. Quigley*, C. Marantz*, J. Berry*.Many photographers†. (First ballot. Vote: 9-0). 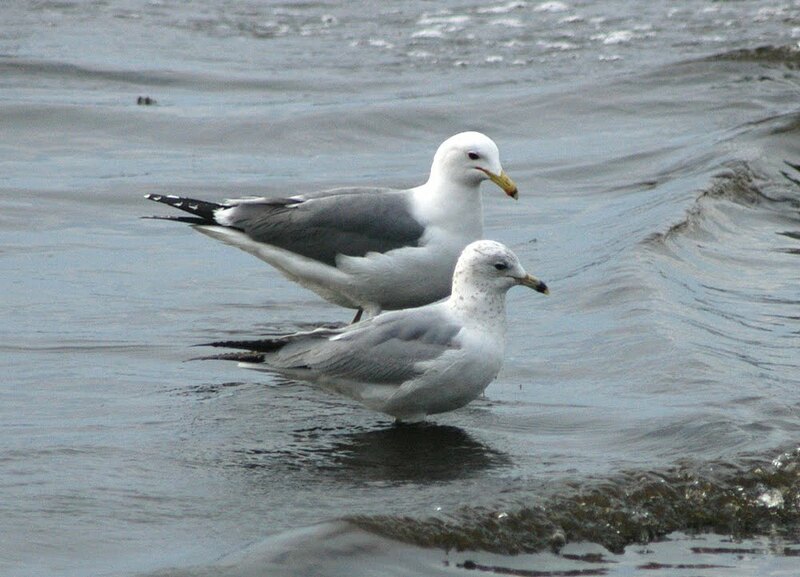 Prior to 2005 there were only two records of California Gull in Massachusetts. Then in 2005, a first winter California Gull was discovered resting in a mixed flock of gulls on a farm field at Nantucket, where numerous observers were able to see and photograph over more than two-week period. 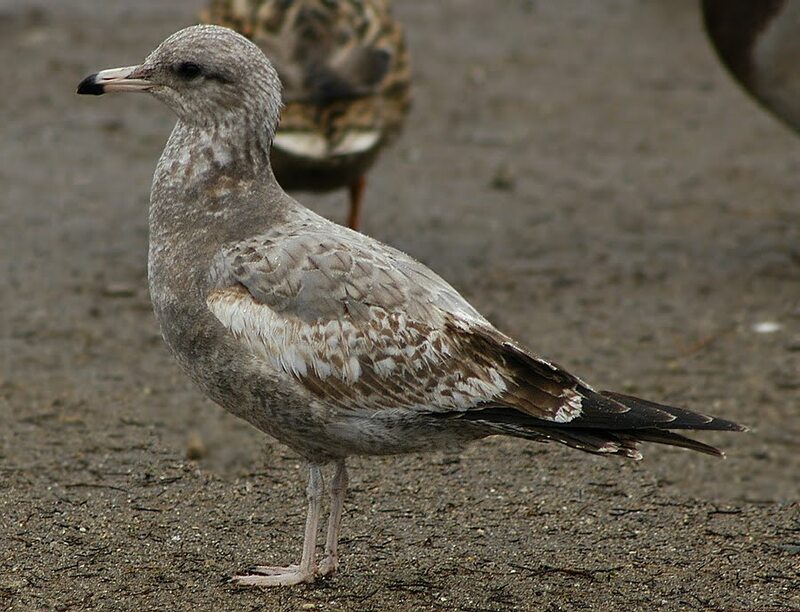 A second California Gull in adult plumage was seen and photographed by many at Lynn Beach. The Nantucket CAGU by J. Trimble. The Lynn CAGU by J. Trimble, with a nice comparison to a Ring-billed. European Turtle-Dove (Streptopelia turtur), #01-27, July 20, 2001, Tuckernuck Island, R. Veit, N. Brewer. 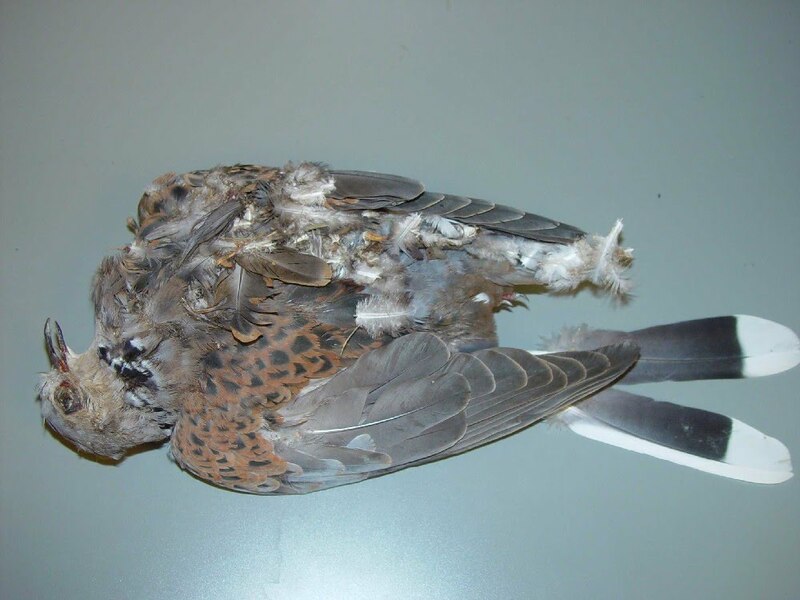 A dead bird discovered as a road kill on Tuckernuck Island was fortunately shown to an ornithologist who recognized it as a European Turtle-Dove. Following an examination of specimens at the American Museum of Natural History, it was determined that the bird belonged to the nominate subspecies, S. t. turtur, the race that occurs in Britain and Western Europe and is a frequent vagrant to Iceland. There are only two previous North American records of this species, the first in Florida in 1990, and the second in Newfoundland in May of 2001. The specimen of this first Massachusetts record is now in the Museum of Comparative Zoology at Harvard University. (First ballot. Vote: 8-1). White-winged Dove (Zenaida asiatica), #04-29, November 23 to December 31, 2004, Nantucket (Nantucket), F. Karttunen* et al. (many photographers†) (First ballot. Vote: 8-1) #05-09, 4/22-5/1, Mount Auburn Cemetery, Watertown, R. Stymeist et al. (many photographers†) (First ballot. Vote: 9-0). 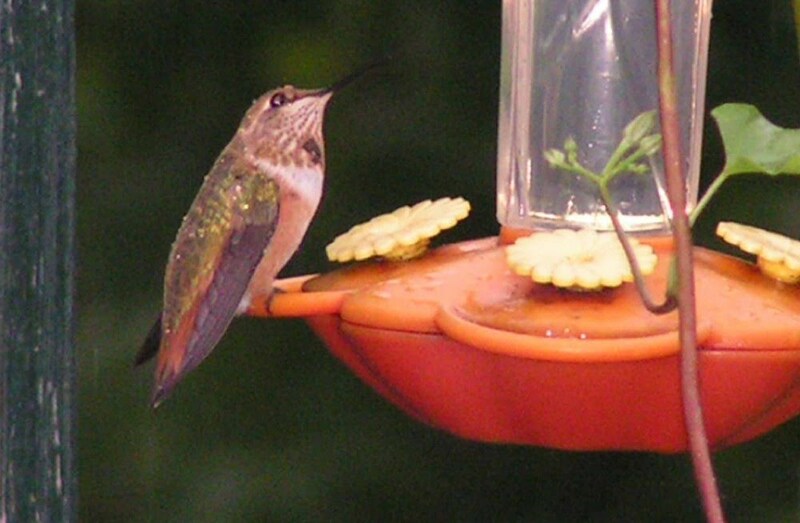 The Nantucket individual was visiting a feeder and was photographed and seen by many. The Watertown bird was discovered at Mount Auburn Cemetery at a time of year when hundreds of birders visit the cemetery every day, so it was seen and photographed by many dozens of observers. The majority of roughly twenty previous Massachusetts reports of White-winged Dove have been from outer Cape Cod and the I Islands, so the Mount Auburn location was exceptional. Rufous Hummingbird (Selasphorus rufus), #04-31, November 10 to December 15, 2004, Ashfield (Franklin), E. Stewart, M. Szantyr†* et al. (First ballot. Vote: 9-0). #05-30, October 8-19, 2005, Byfield (Essex), R. Crist, P. Brown*† (First ballot. Vote: 8-1). 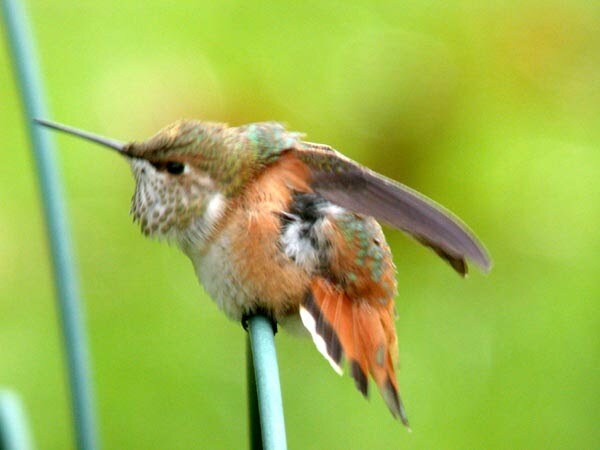 A hatch-year male was netted and banded at a feeder in Ashfield, and measurements and photographs in the hand showed conclusively that the bird was a Rufous Hummingbird. Efforts to catch another hatch-year male at a feeder in Byfield were unsuccessful, however photographs taken of the bird spreading its tail clearly conclusively showed R5 (i.e., the fifth rectrix) to be wide and rounded, unlike the narrow and pointed R5 of the very similar Allen’s Hummingbird (S. sasin), a species that has also been previously recorded in Massachusetts. The Byfield Rufous, spread-tail, by P. Brown. Ash-throated Flycatcher (Myiarchus cinerascens), #04-30, November 26 to December 19, 2004, Rockport (Essex. Vote: 9-0), T. Burke, J. Berry*, T. Spahr*, B. Volkle*, P. Brown† et al. (First ballot) #05-22, May 20, 2005, Hingham (Plymouth), G. d’Entremont* (First ballot. Vote: 8-1). Birds of Massachusetts (Veit and Petersen, 1993) cites only eight records of this species, but since the publication of that reference no fewer than a dozen more have been reported. All but three previous state records have been in November and December, and there is only one previous spring record. Cave Swallow (Petrochelidon fulva), #04-35, November 26, 2004, Cotuit (Barnstable), J. Trimble* et al. (First ballot. Vote: 9-0). #04-36, November 27, 2004, Chatham (Barnstable), J. Trimble† et al. (First ballot. Vote: 9-0). The first and long-anticipated record of Cave Swallow in Massachusetts occurred in November of 2003 following reports from coastal Rhode Island and Connecticut during November of previous years. This could herald an increasing trend, since Cave Swallows are appearing with increasing frequency on the Mid-Atlantic Coast, and the observers who discovered the birds this year specifically made a point of looking for them following favorable conditions for the second year in a row. Townsend’s Solitaire (Myadestes townsendi), #04-16, November 27, 2004, Eastham (Barnstable), J. Hoye and A. McCarthy* (First ballot. Vote: 8-1). #04-34, December 19, 2004, Gloucester (Essex), S. Hedman*, B. Volkle* (First ballot. Vote: 9-0). There are roughly a dozen records of this western vagrant in Massachusetts, all of them in winter. In general these birds tend to linger throughout the winter, affording many birders the opportunity to see them. However, no doubt due to their somewhat retiring behavior and habit of foraging deep in thickets and cedar groves, these individuals were never relocated. Townsend’s Warbler (Dendroica townsendi), #04-17, December 19, 2004, Rockport (Essex), M. Goetschkes, I. Giriunas*. (First ballot. Vote: 8-1) #05-15, May 5, 2005, Ipswich (Essex), A. Burke* (First ballot. Vote: 8-1). 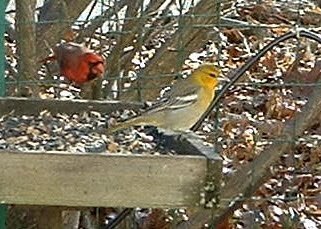 The Rockport bird was discovered on the Cape Ann Christmas Bird Count, when the observers carefully noted the streaked yellow breast and the bold black eye patch set against a bright yellow face, thus eliminating other “look-alike” Dendroica warblers. The Ipswich bird was accompanied by few details, but an excellent accompanying field sketch showed all pertinent field marks. There are fewer than ten prior records for this western vagrant for Massachusetts. For more information about the MARC, or to see copies of previous MARC reports, see <http://Massbird.org/MARC/>.Current members of the MARC are Dennis Abbott, David Clapp, Davis Finch, Erik Nielsen, Blair Nikula, Wayne Petersen (Chair), Robert Stymeist, Scott Surner, and Jeremiah Trimble. Marjorie Rines is Secretary.